The Arts Transition Programme was conducted on 23 Feb 2017 for newbie students commencing study for the first time in SASS. The programme began with an icebreaker game of SASS Bingo. The objective of the game was to fill up a rubric of twenty boxes consisting of activities associated with the Arts and Social Sciences. They had to introduce themselves to their peers and find out which item they could attach their interviewee's name to. This activity gave them the opportunity to interact with other new students and make new friends. The following session was conducted by Ms. Sara Khun and Ms. Namita Santra from the Library and Learning Commons on 'Using reputable academic resources' and other treasure of the Monash library. Using Nearpod, the students were engaged in interactive activities guided by our knowledgeable and capable academic liaisons. 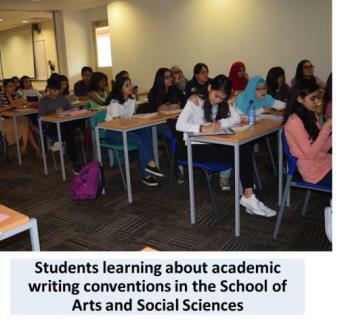 The students then learned about disciplinarity and academic writing in the Arts and Social Sciences from Ms. Melissa Wong who guided them through the expectations for academic writing in the School. The programme ended with a question and answer session.